A gas or wood burning fireplace can cost you approximately $3,000 to purchase and install plus the cost of the gas lines, which can run as much as $400. An electric fireplace costs approximately $1,000. Because electric fireplaces don’t require ventilation, they can go in any room with a 120 Volt electrical outlet to plug into. The electric fireplace simply hangs from the wall so the possibilities are endless. Imagine an electric fireplace flickering nearby while soaking in your tub, reading fireside in your family room or enjoying an al fresco evening by the flickering light of your outdoor living room hearth. Manufacturers are capitalizing on this trend in the hearth industry launching new electric fireplace product lines in many styles. These electric fireplaces have cool capabilities that traditional fireplaces just can’t pull off. Some have colored LED backlighting that can be programmed to rotate up to nine different colors or remain constant. The base of the firebox can feature stones or a glass rocks. In order to appreciate the beauty of these affordable faux fireplaces, I put together a Vlog with some video clips so you can really appreciate how an electric fireplace can light up a room. Surfaces with shimmer and sheen go perfect with today’s popular transitional style. Surfaces that shimmer are trending in home decor and that makes glass tile an ideal tool to add sparkle to any space. From kitchen backsplashes to bathtub surrounds, accent walls and pool perimeters, indoors and outdoors, glass tile is IN. The National Kitchen & Bath Association says the current look in the kitchen is all about surfaces with sheens that gleam alongside stainless steel appliances, capturing light and complimenting more traditional elements such as wood cabinetry. 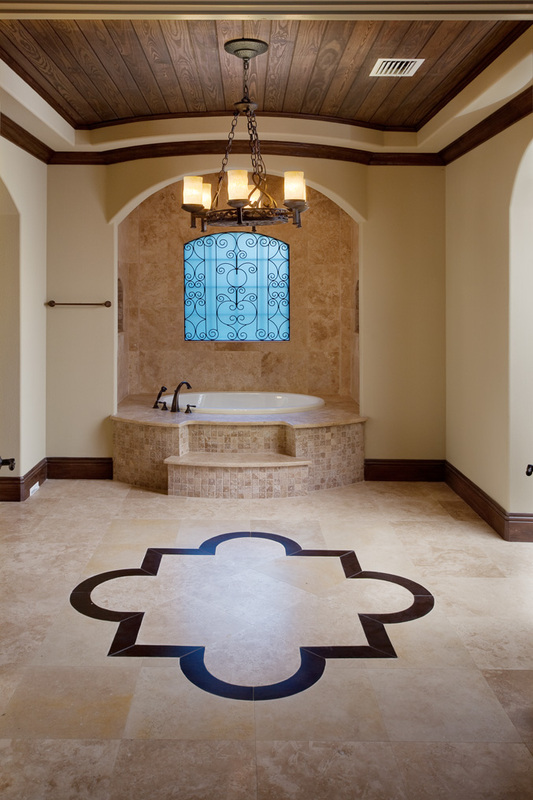 Orlando Custom Homebuilder Jorge Ulibarri uses a mixture of glass, stone and metallic tile mosaics in many of his homes. “Travertine or stone mosaics work well in more rustic styles while the glass tile mosaics help fuse rustic and contemporary. It’s an affordable architectural detail when used in small, high profile areas,” says Jorge. Glass tile is a timeless material adorning ancient temples, monuments and other great architectural works. Today’s modern twist on glass tile mixes it up in mosaic patterns with other materials such as stone, ceramic and metal. Glass tiles come in many shapes, colors and sizes and are available in sheets of predesigned patterns. Prices vary from a low $5 per square foot sheet to upwards of $15 to $30 per sheet. Although these mosaics may look like artisans painstakingly handcrafted each design, glass tile mosaic sheets are easy to install. Here are some of the hottest looks for 2013. Rectangular tile or glass stick mosaics are popular shapes and patterns in modern home design. The larger rectangular blocks known as subway tile are surfacing in many kitchens where the aim is to incorporate simpler, more modern elements. Shiny glass tiles combined with stainless steel and industrial materials work to create a transitional style that blends traditional and contemporary elements. Glass mixed with stone or metallic tiles in a mosaic lends itself perfectly to that Mod-Mediterranean style that blends Old World with modern design. Metallic tile alone can add an industrial edge to a room as an accent wall or niche backdrop. These mixed mosaics merge shiny and natural materials to pull together stone floors with beams and contemporary fixtures. As an example, Orlando Custom Homebuilder Jorge Ulibarri is framing a wall-to-ceiling fireplace with a mixed mosaic design of stone, glass, and metallic. Many of today’s pools feature glass tiles on the sides and bottoms to capture light and liven up the color of water. A blue or emerald-green glass tile bottom can make pool water mimic the azure hues of the Caribbean ocean. Because the glass tiles are durable, tough, and resistant to mildew and stains, they are ideal for embellishing outdoor areas such as water features. The new hue for 2013 as anointed by Pantone, the global color authority, is Emerald. This jewel-tone hue is surfacing as color pops in home décor and fashion. Consider incorporating emerald glass mosaics to sparkle up a space. Pantone suggests infusing its Color of the Year in emerald painted accent walls and home accessories as well. Check back soon for more home design inspiration and new home construction tips. I’m headed to the NAHB International Builders’ Show in Las Vegas next week. We will return with the latest products, sources and trends in home design and new construction. I can’t wait to share with you more about what I discover. Thanks for reading. 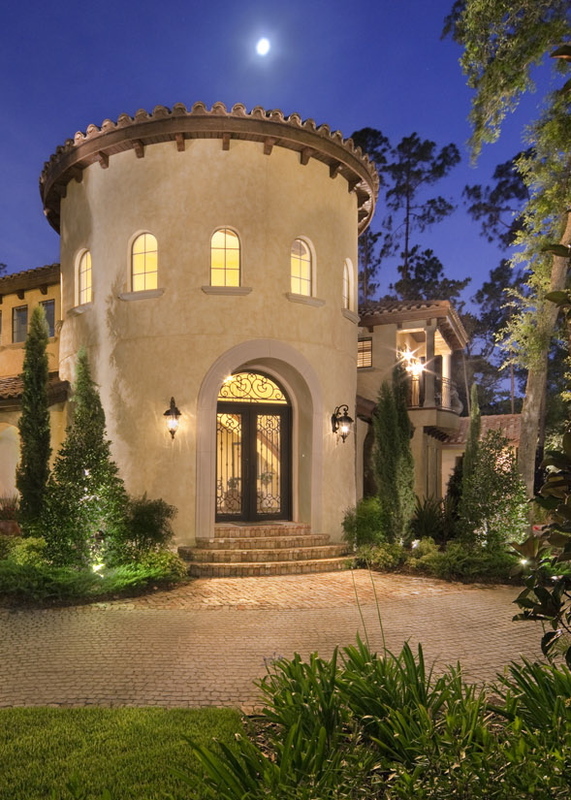 Wrought iron goes with any architectural style and it never goes out of style. It’s one of those architectural and decorative elements that instills a sense of legacy in a home. Whether wrought iron takes the shape of a chandelier, staircase or front door, the material symbolizes something solid with a storied past as if it has endured for generations. Wrought iron can showcase a homeowner’s personal expression or add period charm. Strategically incorporating wrought iron accents into a home’s décor can add character and ambiance for an affordable price. Here are a few suggestions. The front door is one of the most highly visible architectural elements that defines the style of a home. A custom-made wrought iron door can make a statement and add to the home’s curb appeal. 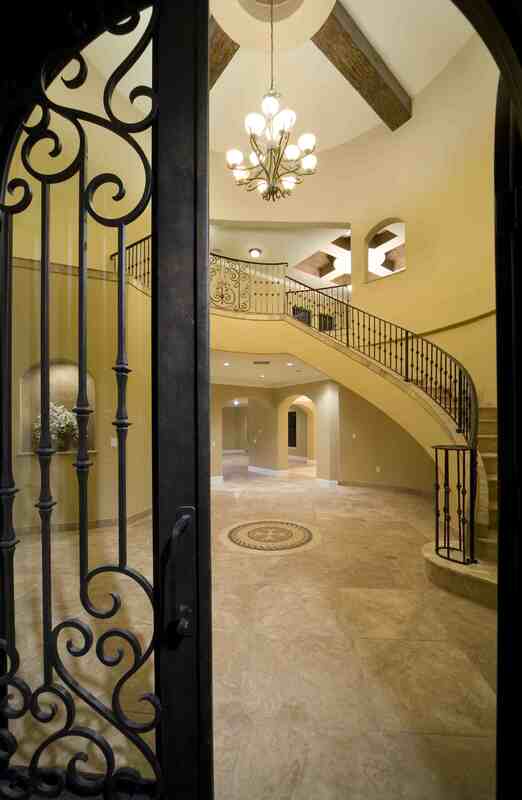 The double-door wrought iron entry is a trademark of Custom Homebuilder, Jorge Ulibarri. “The beauty of wrought iron is that it can carry the design theme throughout the house from the front door, railings, winery door, windows and so on,” explains Jorge. Oftentimes, the homeowner designs the wrought iron details of the front door and Jorge orders it custom-made and imported from an artisan in Monterey, Mexico. There is a significant cost savings Jorge can get by working directly with artisans in Mexico. Jorge is able to pass on the savings to his clients. “I’ve had clients who have added their initials to the scrollwork of front door and the hand railing design.” One example pictured here showcases a front door with matching scrollwork on the floating staircase. Homeowners can expect to pay approximately $6,000 to $8,000 for one of these doors depending on the size and the design. “I do caution homeowners to make sure they are purchasing from a reputable company and that the door is certified and tested. I’ve seen very poorly crafted doors that can be a nightmare,” says Jorge. 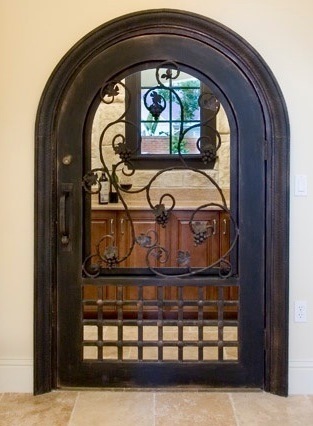 The winery door is another highly visible opportunity to showcase wrought iron. 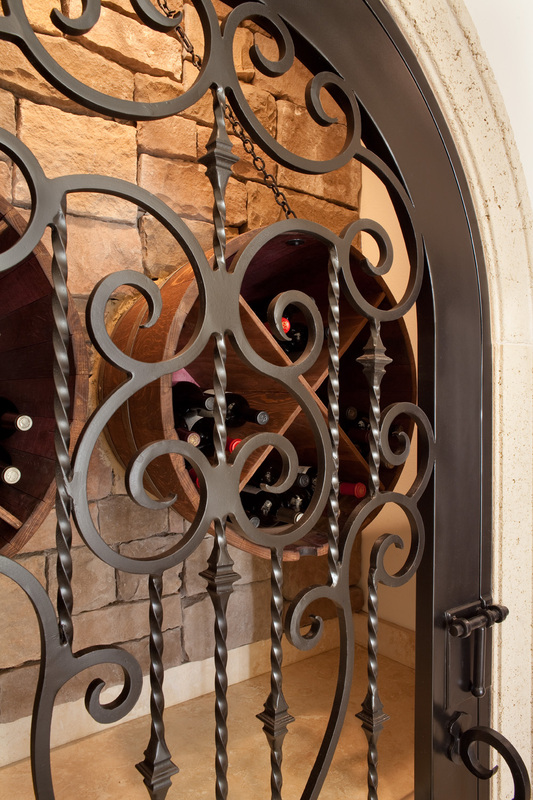 The doors to the winery can feature a theme such as leaves and grapes or perhaps the homeowner wants his or her initials. Jorge says the cost to design, handcraft and import a winery door is approximately $1,800. 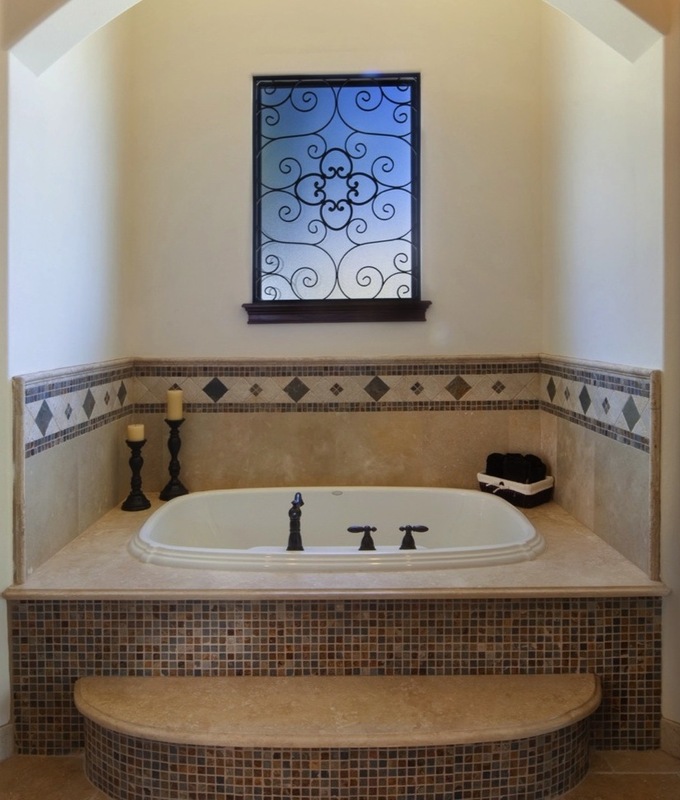 The master bath is an ideal area of the home to add a touch of wrought iron as well. One example pictured here is the window in the master bath overlooking the tub. This window is made of frosted glass for privacy and serves as the backdrop for wrought iron detail. Jorge says the cost to create this wrought iron decorative window is approximately $300 to $350 depending on the window size. For more design ideas with wrought iron accents including various locations and uses, watch Trade Secrets by Jorge, a video series that offers money-saving tips to create that custom-home look on a budget.